If, in 1968, someone had told you that a movie about a planet ruled by intelligent apes was about to be released and it was destined to be one of the most enduring and fruitful franchises in movie history, you would have thought them nuts. But that's exactly what happened. 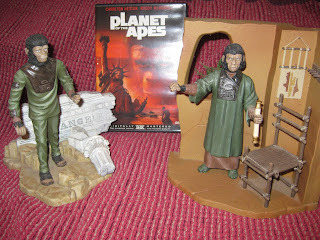 After making its stunning debut, Planet of the Apes spun off four sequels, a TV show, comic books, games, toys and more. Then in the 21st century, it was rebooted (twice) and more films are planned for the future. In today's episode of Spine and Sprocket, we discuss the original release starring Charlton Heston, Roddy McDowell, Kim Hunter and Maurice Evans. It is a film that is well worth watching for the first time or again for the umpteenth time. Of Planet of the Apes, Roger Ebert said "there are some good action sequences, some amusing twists, some easily digestible sociological and philosophical points, and a thoroughly satisfactory surprise ending." That's true, Roger, but we think it's way better than that. Join Dave (an honest to goodness ape-o-phile), Jeff (bananas about apes) and Dennis (who never met an ape he didn't like) as we swing down memory lane and discuss our love of this science fiction classic.